For a limited time TJs is pleased to offer upto 20% off* the tanalised range in either a Apex or Pent design. The price listed includes DELIVERY AND FITTING within the local area**, if you fall outside this area please request a quotation for delivery and installation. The tanalised range is maintenance free as the timber is pressure treated and has a upto 15 year guarantee. Need extra storage at home look no further than TJs as we have it covered. ** Please see terms and conditions for additional information regarding installation. 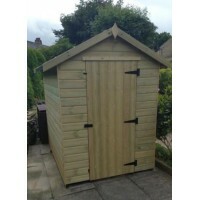 TJs are pleased to offer upto 20% off the Pressure Treated Garden Shed range Currently..
TJs are pleased to offer upto 20% off the Pressure Treated Garden Shed range Currently on sale is..